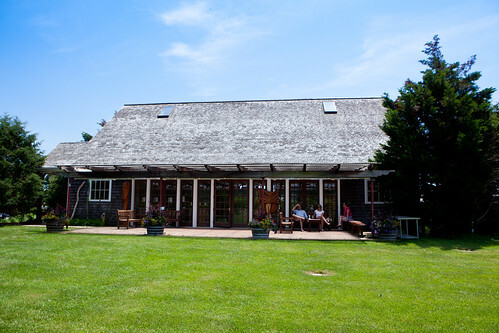 My final stop of my Hamptons weekend trip back on nearly two weeks ago, was Channing Daughters Winery. 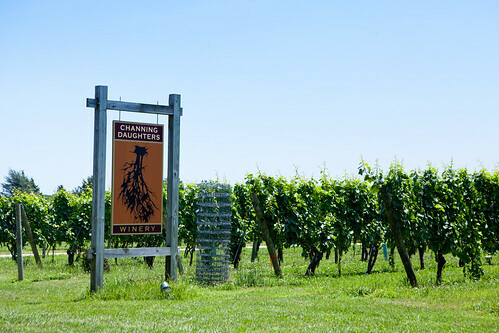 The reasoning behind picking this particular vineyard compared to many others in the North Fork of Long Island was its experimentation of how they’d ferment their wines (using either commercial yeast or natural yeasts of its surroundings), to aging in oak or stainless steel barrels, yielding different tastes, smells and textures. Driving along Scuttlehole Road, it’s a little too easy to drive past their driveway but once you find it, it’s easy to find the tasting room/house. 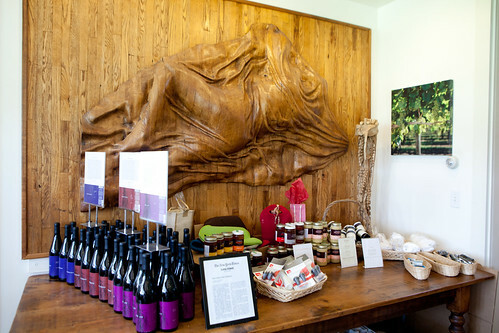 Entering this building you may be mesmerized by the large wooden sculptures at the foyer or hung at the wall near the tasting counter. Barrels were used as tables to display their wines for sale and there were many to choose from. I ended up requesting a wine tasting flight of what they had to offer. 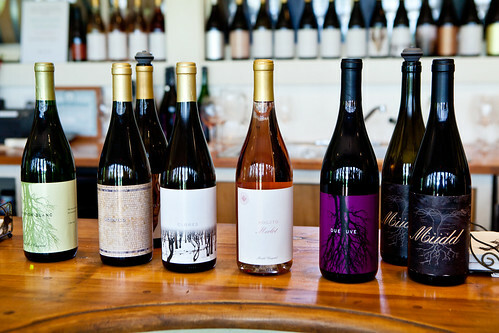 Their current vintages on sale (and for sampling) range from 2007 to 2010. 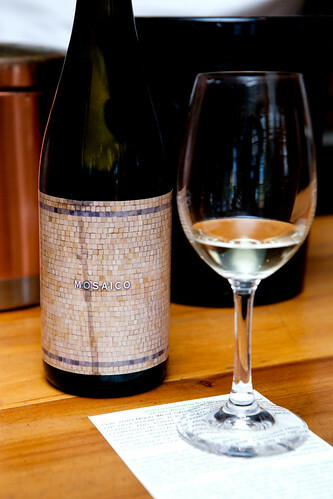 Starting from their whites (Mosaico and Clones): the 2008 Mosaico is a white wine where all the varieties were grown, harvested, pressed and fermented together in a stainless steel tank and Slovenian and French oak barrel. It’s very unique as they crush almost all grape varieties (hence the name Mosaico) except for the Muscat. It’s dry, fruit-forward and I can imagine it be paired with fish or chicken. 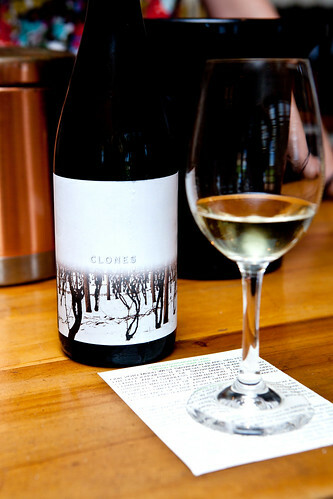 The 2008 Clones is a barrel-fermented chardonnay, composed of 90% Chardonnay, 6% Tocai Friulano, 1% Gewurztraminer, 1% Aligote, 1% Semillon and 1% Viognier. This dry white wine is straw-colored with medium intense aromas and flavors of pear, apple, mineral, and citrus fruit. It has some sharpness and juiciness, makes it quite intriguing. The 2010 Rosato di Merlot is 100% Merlot grapes that were whole cluster-pressed and fermented in a stainless steel tank. 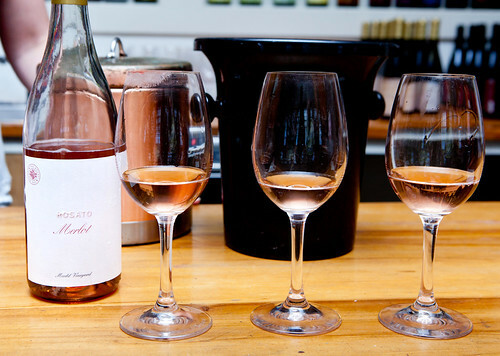 This is a dry, juicy, medium-bodied Rosé. This year the color is a pale pink and it is a playful, aromatic, very versatile wine. The flavors and aromatics are reminiscent of raspberries, strawberries, watermelon, cherries, spice and minerals. 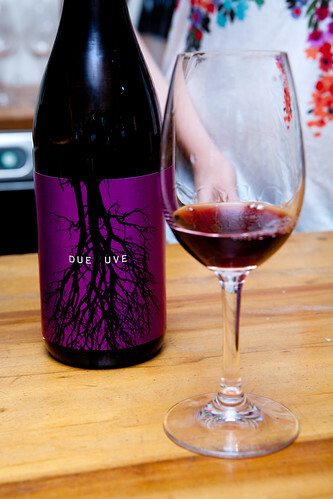 Moving onto the reds, the 2009 Due Uve (two grapes) is a blend of 72% Syrah and 28% Merlot. 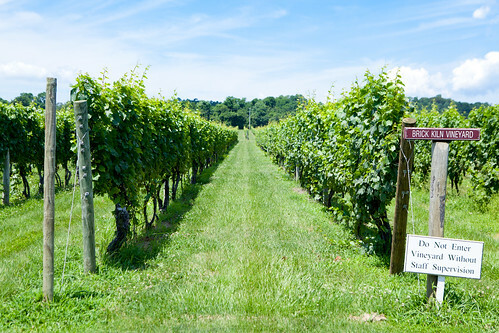 The Syrah comes from the Mudd West vineyard in Hallocksville and the Merlot comes from Sam’s Vineyard in Aquebogue. The wine was racked to barrels, hogsheads and puncheons (23% were new, 77% were old) where it spent eight months before a light filtration and gravity bottling. This wine has a translucent ruby red color with purple inflections. The wine is dry, medium-bodied and juicy, has moderate alcohol and is fresh and delicious. It’s floral, fruity, with hints of mineral and black pepper spice components. The 2007 MUDD was my favorite of the entire flight and it will taste even better if it aged a couple of more years. 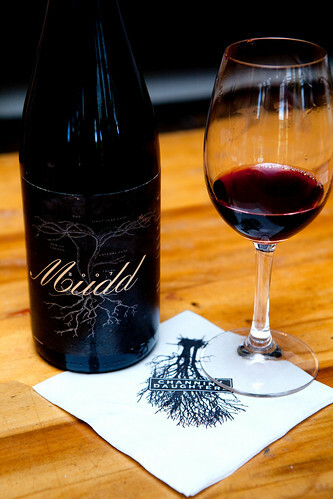 This wine is composed of 60% Merlot, 21% Syrah, 9% Dornfelder, 5% Cabernet Franc and 5% Blaufrankisch. It is dry, medium-bodied, has moderate 12.8% alcohol, balanced acidity, soft, ripe tannins. After that wine flight tasting, I’ve went outside to lounge at their porch soaking in the serene calm at the peak of the afternoon. A fine lazy afternoon.